The Odissi lecture demonstration by Padma Shri Madhavi Mudgal on the evening of Tuesday 9th August at Saptaparni hosted along with Deepanjali was indeed a rare treat.A brief introductory lecture on the history and salient features of Odissi like the "Tribhang" pose was followed by a presentation of four items by Madhavi and her niece Arushi Mudgal. One of the most ancient dance forms of India, Odissi can be traced back for centuries as depicted in temple sculpture.Padma Vibhushan Kelucharan Mohapatra the guru of Madhavi Mudgal was one of the legendary figures instrumental in its revival from near extinction.First major public performance by Priyambada Mohanty was witnessed and appreciated by Dr.Charles Fabri who was also of great assistance in the rebirth of Odissi.The "Chowk" stance and a few basic steps were demonstrated by Arushi to complement Madhavi's intro. Mangalacharan the traditional invocatory item of odissi was then presented by Arushi. The Bhumi and Trikhand pranams which this piece contains were done with exquisite grace by the young artiste. A pure nritta item by the same dancer followed. Madhavi Mudgal then recited "Dhira Samire", an Ashtapadi by Jayadeva which is a staple of the Odissi repertoire considering the long tradition of the Geeta Govind association with the temple dance in the Jagannath temple of Puri. Mukha abhinaya displayed consummate artistry as expected of the outstanding senior students of Kelucharan Mohapatra. 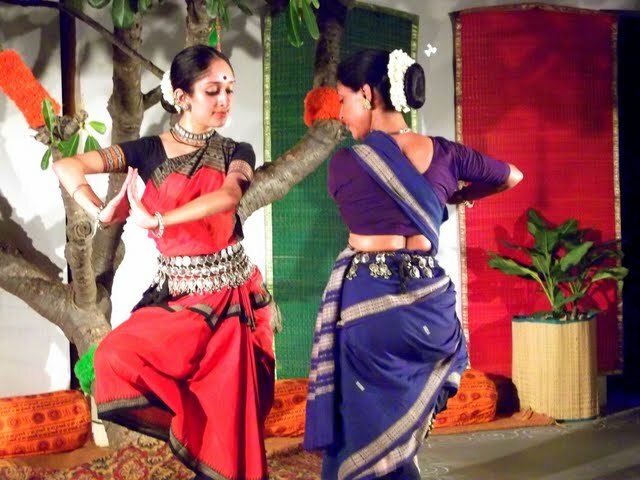 Recital was rounded of by a choreography of Madhavi, done by both the artistes. Informality of the program which was done to recorded music was suggested by eschewing an elaborate costume and headdress. Padma Shris Jagdish Mittal and Ananda Shankar Jayant, Shri Kalakrishna and Deepika Reddy graced the occasion.